build-up in your muscles and unsurpassed mental focus. What that means is heavier weights, improved muscular endurance and harder workouts. 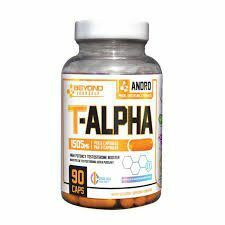 ACTIVE INGREDIENTS: Creatine Monohydrate, Beta-Alanine (3-aminopropanoic acid), Citrulline Malate [2:1], Arginine AKG 2:1 (alpha-ketoglutarate), DMAE (dimethylethanolamine), Pharmaceutical Grade Caffeine Anhydrous, L-Norvaline. 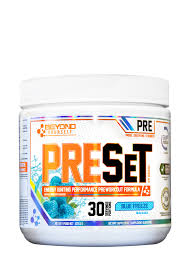 RECCOMENDED USE: Once tolerance has been assessed, mix 1-2 scoops with 6-12 oz of cold water and consume 30 minutes before training. For best results take on an empty stomach. 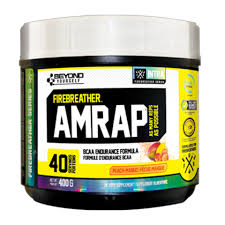 For increased effect use a third scoop at least 3 hours after using the initial 2 scoops. Do not take more than 2 scoops at a time. DO NOT EXCEED 3 SCOOPS IN A 24H PERIOD. NON-MEDICINAL INGREDIENTS: Tocopherol [Natural Vitamin E], natural citrus flavour. 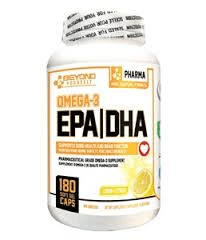 RECCOMENDED USE: Take 4 capsules daily with meals or as directed by a health care practitioner. Medicinal Ingredients (per scoop): BioEnergy D-Ribose (d-ribose l-cysteine) 3000 mg, Maltodextin 44 g.
Non-medicinal ingredients: Silicone Dioxide, Natural and Artificial flavor and colour. 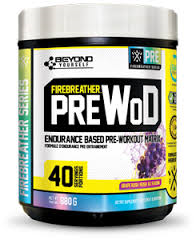 RECOMMENDED USE: Good source of carbohydrates to help support energy production and to help maintain peak performance/increase endurance during both sustained (60+ minute) and high intensity exercise. RECOMMENDED DOSE: Adults - Intended for use as a sports supplement. 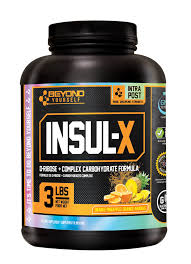 Mix 1 scoop of Beyond Yourself INSUL-X with 8 oz of cold water and take 30-90 minutes before exercise . For best results, use up to three times daily. Take 1 serving before / 1 serving during your workout and 1 serving within 2 hours of training. For an added advantage, our TRU-MATCH flavour system allows you to add INSUL-X to any other TRU-MATCH flavoured Beyond Yourself products (ex. KETO-ICE or AMRAP). Looking to add lean muscle, maintain valuable gains and/or activate your metabolism? Protein is essential for repair and growth of muscle after exercise. Research shows that protein consumed before exercise and within a critical 30 minute window post-workout will help with muscular growth and recovery. 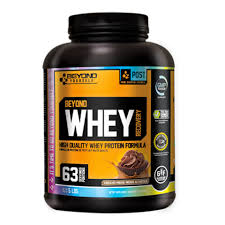 Each scoop of BEYOND WHEY RECOVERY contains 23 grams of highly bio-available whey protein. Sweetened with Stevia leaf, an all natural and side effect-free sweetener, you get a great tasting protein without calories or affected blood sugar levels. Furthermore, every serving is loaded with over 5 grams of BCAA's, the most important amino acids for muscular volume, growth and recovery. INGREDIENTS: Dual-core whey protein matrix (High quality ultra filtered whey protein concentrate, whey protein isolate), AMI-NO-LIMITATION complex (Glutamine, Taurine, Glycine), INZYME DIGESTION complex (Protease, Lactase), BY Essential Fatty Acids (Flax seed oil, conjugated linoleic acid), STEVIA SWEET (stevia), sucralose, xanthan gum, carrageenan gum, natural and artificial flavours and colours. RECCOMENDED USE: Intended for use as a dietary supplement. 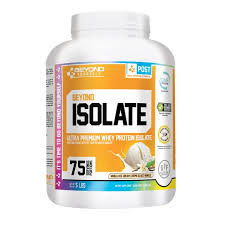 Depending on your individual protein needs, mix 1 to 2 scoops of GO BEYOND WHEY PROTEIN twice daily (or as required to meet your daily protein requirements) with 6 to 12 oz of cold water (6oz of water to each scoop). Simply blend with a spoon or use a shaker bottle.